Isolde Donohoe is an artist currently in her final year of Sculpture and Combined Media at the Limerick School of Art & Design. She works in many disciplines but is most attracted to dance and voice. She creates performances usually stemming from an image of a feeling she has had. Sometimes she moves alone and sometimes she choreographs a group. At this session she will discuss her recent participation in performances by Amanda Coogan and Ceara Conway, as well as her own current research. Join us for the Workspace Social and don’t forget to bring your lunch! 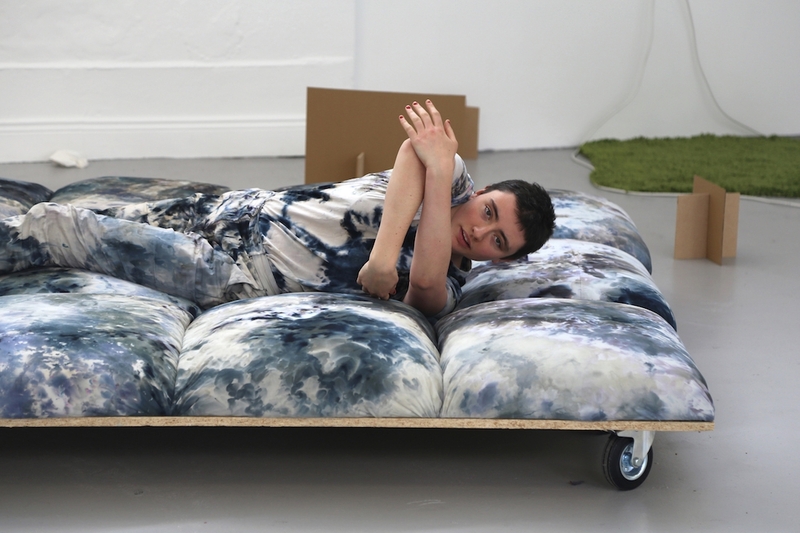 Image: Isolde Donohoe, from Stormy Sky Dance (2017), a performance with OSB, wood, braked castor wheels, ice, fabric dye, 200 thread count cotton sheets, polyester duvet sections, staples, plywood sheet, MDF, carriage bolts, roofing bolts, polyester thread, steel masonry nails, elastic lurex, polycotton socks, cotton t-shirt, polycotton zip-up hoodie, cotton knickers, cotton bra, cotton trousers, and artist’s body. Photograph by Henneke Andrea.